Earl Plummer Inlaid Lapis Lazuli Ring Earl Plummer, winner of the Best of Jewelry award at the 2013 Santa Fe Indian Market, is showing his talent in design as well as workmanship. 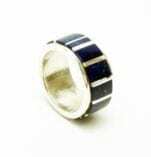 This ring is inlaid with three separate pieces of lapis lazuli. The ring is highly polished, a fact that is a bit lost in the digital photographs. Size 10 1/2; band tapers from 7/8 in. to 1/8 in. Lorenzo Tafoya sterling silver corn ring Lorenzo Tafoya works with his wife Mary Tafoya making mosaic inlaid jewelry. He also creates jewelry on his own. This ring has corn designs overlaid on the band; the oxidized surface creates a beautiful contrast with the polished sterling silver. It is inlaid with turquoise, mother of pearl, and coral. Size 12 Band is 7/16 in. wide. Heidi BigKnife Spiral Ring An interesting ring that wraps itself tantalizingly around your finger. Ring is set with a reddish "pebble". Dark geometric shapes dot the band, which has a soft matte finish. Size 6; stone is 1/2 in. x 1/4 in. Lorenzo Tafoya Inlaid Ring Lorenzo Tafoya works with his wife Mary Tafoya making mosaic inlaid jewelry. 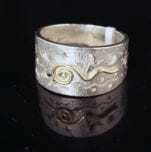 He also creates things on his own, such as this ring made from bone. The ring is inlaid with turquoise, spiny oyster shell, mother of pearl, and sugillite. Size 8 1/2. Band tapers from 5/16 in. to 1/8 in. Heidi BigKnife Quartz Ring A ring that charms with its subtle beauty by Shawnee artist Heidi BigKnife. The silver band has a soft matte finish and is decorated with repeating circles. Similarly, the stone is not highly polished or finished, retaining its natural shape. Size 7 1/2; 1/4 in. wide band. Stone is 1/2 in. x 5/8 in. 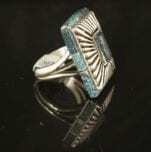 Earl Plummer Rug Design Ring Earl Plummer, winner of the Best of Jewelry award at the 2013 Santa Fe Indian Market, is showing his talent in design as well as workmanship. 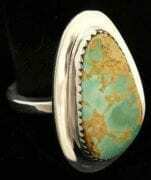 This ring is stunningly beautiful, with a natural turquoise cabochon containing interesting shapes of pyrite. The band is adorned with traditional Navajo rug designs. The contrast between the polished and the darkened silver is wonderful. Size 10 1/2; the zig-zag band is 3/4" wide overall, while each section is 1/4" wide. Cabochon is 7/8" x 1/2"
Althea Cajero Sterling silver cuttlefish cast ring with coral A sterling silver ring, cast from cuttlefish bone. Stunning coral cabochon set in 14K gold bezel. Size 7 3/4; band tapers from 3/8" to 1/4"
Duane Maktima, a long-time metalsmith and teacher, combines strong designs with flawless execution. This sterling silver shell-form ring combines a highly polished exerior with a hammered silver interior. Size 7 1/2; band tapers from 7/16" to 1/8"
This ring has a beautiful Cripple Creek turquoise cabochon set in a scalloped bezel. The band is stamped with curved and scalloped designs. size 9 3/4; band is 5/16" wide; platform is 1 5/16" x 3/4". A simple ring with a beautifully matrixed turquoise cabochon from the Royston mine. Scalloped bezel sets the stone off perfectly. 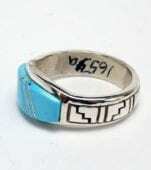 size 9; bandi is 1/8" wide; platform is 1 1/4" x 3/4"
Master designer and silversmith Earl Plummer has created a ring inlaid with natural turquoise, with incised rug designs on either side of the center. Beautiful light blue turquoise with a spot of deeper, more vivid blue, close to the center. 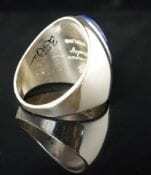 Size 12 ring; 3/8 in. at the widest point, tapering to 3/16 in. at the base for greater comfort. 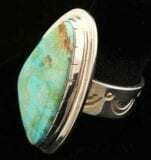 Earl Plummer Morenci Turquoise Ring Earl Plummer, winner of the Best of Jewelry award at the 2013 Santa Fe Indian Market, is showing his talent in design as well as workmanship. 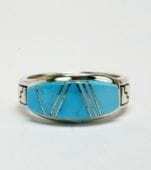 This ring has channel inlay of natural Morenci turquoise: beautiful shade of blue with brown and silver matrix. An attractive oxidized design adorns each side. Size 12 1/2; band tapers from 1/2 in. to 1/4 in. Lorenzo Tafoya Inlaid Shell Ring Lorenzo Tafoya works with his wife Mary Tafoya making mosaic inlaid jewelry. 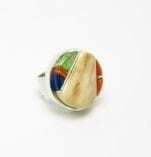 He also creates jewelry on his own, such as this ring made from shell. 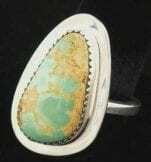 The ring is inlaid with turquoise, spiny oyster shell, mother of pearl, and sugillite. Jewelry made from shell inlaid with semi-precious stones and shell have been excavated in pueblo ruins dating back centuries. This ring honors that ancient technique. Size 10 1/2. Band is approximately 1/4 in. wide. Lorenzo Tafoya Inlaid Silver Ring Lorenzo Tafoya works with his wife Mary Tafoya making mosaic inlaid jewelry. He also creates jewelry on his own. 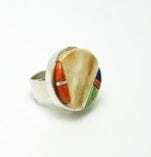 This sterling silver ring is inlaid with turquoise, spiny oyster shell, mother of pearl, black jade, agate, variscite, and more. Size 9. Band is 3/8 in. wide. 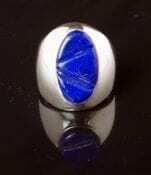 Hanson Smith Lapis Lazuli Inlay Ring Navajo silversmith Moogie Smith creates jewelry with deep inlay. 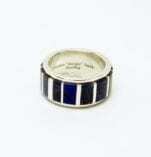 This ring is inlaid with various shades of lapis lazuli. Some are dark and flecked with minerals, while others are brighter and clearer. Sterling silver inlay channels are of varying widths and heights, creating an interesting surface. Ring is size 8 1/4; band is 3/8 in. wide. 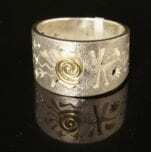 This sterling silver ring has a 14k gold depicting the common petroglyph theme of a spiral. All other designs, including the kokopelli, antelope, stars, and more, are pierced. Nicely pebbled texture. Size 6; band width ranges from 1/4" to 1/2". 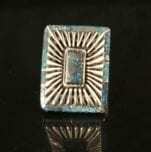 This vintage silver ring contains six turquoise cabochons, twelve silver beads, and stamped designs. 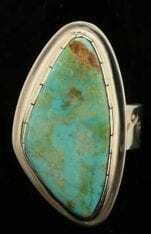 The patina and coloration of the stones, as well as the wear on the designs, indicate that this is a well-worn ring. 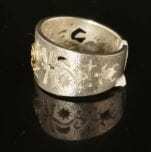 Ring is not stamped as "sterling", nor is there an artist name. Ring is size 7 1/2; 1/4" half-round wire has been hammered to a V shape near the stones, and has been stamped with geometric designs. This sterling silver ring has a 14k gold spiral overlay. All other designs, including the dragonfly, turtle, bear claw, sun, stars, and more, are pierced. Nicely pebbled texture. Size 8; band width ranges from 1/4" to 1/2". The moon shape on the front of the ring is 14k gold. The rest of the ring is sterling silver. All designs except for the gold are pierced (cut out of the silver). As with most of Panteah's jewelry, the designs are inspired by petroglyphs. 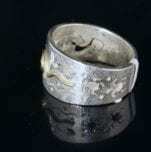 A frog, male rain clouds (with lightning) and a turtle adorn this ring with a nicely textured surface. Size 7; band tapers from 1/2" to 1/4"
This sterling silver ring has a 14k gold spiral overlay. All other designs, including the turtles, kokopelli, serpents, etc., are pierced. Nicely pebbled texture. Size 9 1/2; band width ranges from 1/4" to 1/2". This sterling silver ring has a centerpiece of 14k gold cross overlay. All other designs, including the rabbit, lizard, stars and others, are pierced. Nicely pebbled texture. Size 7 1/2; band width ranges from 1/4" to 1/2". This sterling silver ring has a 14k gold spiral overlay. All other designs, including the dragonfly and others, are pierced. Nicely pebbled texture. Size 7 1/2; band width ranges from 1/4" to 1/2".